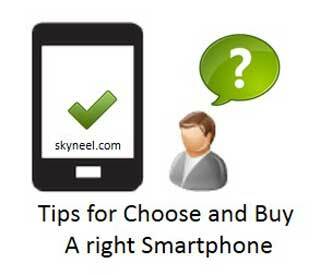 Hello friends, here is few tips to buy right Smartphone. At present time billion of users are uses different types of smartphone due to different latest features and low budgeted cost. Mobile market spread out very quickly around the world because after few time most of the companies launch another latest smartphone with latest technology and peoples replace his old phone and buying latest technology smartphone. But before buying new smartphone you have to remember few important tips which protect your money for buying new gadget. If you want to buy any latest technology smartphone first you have to check what the screen size is and display quality of smartphone. At present time most the person love for big screen smartphone but they fell problem to hold this kind of smartphone and most of the big size smartphone does not gives you better resolution and you know very well low quality resolution phone does not gives you better display quality. So always check better resolution and displays size before buying any smartphone. If you have better budget for buying any smartphone then you have to buy full HD smartphone, because at present time most the person love full HD 1920*1080px resolution smartphone. Full HD smartphone are must better when you are playing any 3D games or watching high resolution movies and many more. If you have low or mid budget then you have to buy low or mid-range resolution quality smartphone like HVGA 480*320px, VGA 640*320, FWVGA 854*480px. You know very well operating system play an important role for any electronic gadget. At present time Android, iOS and Windows operating system are most popular operating system. Apart of these operating system synozon mode, Firefox and many other type of software also used in smartphone in the market. Lot of latest version of operating system are available in the market. At present time Android 5.0 lolipop version is used in the market. Apart of this operating system there are few most popular operating system also used for Android smartphone like Kitkat version 4.4, 4.4.2 and 4.4.4. If you talk about windows phone then most popular windows 8.1 version is available in the market. These latest version have different great features also. Another important thing is to kind in mind before buying any smartphone is what is the processor and ram of smartphone. Most of the smartphone have Octa-core processor but they does not provide sufficient ram, Quad-core processor also not provide much better RAM. If you buying any low speed processor and ram then you are facing hang problem of your smartphone. So always remember if any company provide 2GB ram with any octa-core or quad-core processor then you have to buy that type of smartphone. You have to also remember about how much internal & external memory supported by the smartphone. If you have better batter internal storage capacity but don’t have external slot for memory then it’s not useful for you and also you are facing problem to store big size files in your smartphone. So, always choose any proper internal and external storage capacity smartphone. You know very well camera quality play an important role of any smartphone. Lot of person daily take pictures of these smartphone and if you have poor or low camera quality smartphone then you will be disturbed. Most of the companies provide 5 or 8 megapixel front camera and 13 mega pixal rear camera but these phone camera quality is not better. Camera quality depends on quality sensor and extra camera features. Sony Company provide CMOS sensor camera quality smartphone which are very popular at present time. So, always remember camera quality before buying any smartphone. Always select much better power quality removable bettor smartphone. Because these smartphone consumed lot of battery due to its different application and if you don’t have charger then you face problem to recharge your battery. So always keep in mind either you have to use minimum 2800 mAH power battery or you can also choose that type of smartphone which support removable battery. On these types of phone you have to replace your battery when you facing this problem. Always remember if your phone have GSM or CDMA then it will support 2G/3G/4G feature. And also keep in mind your phone support mini or mico sim also. I hope you like this Buy right Smartphone guide from which you will be able to easily Buy right Smartphone without any extra efforts. If feel any problem to choose a right Smartphone, then please use comment box. Thanks to all.